I’m trying to work my way through the Gregg Shorthand Manual Simplified and have come across a sentence that I need help on. I get the second half but not the beginning. Could anyone help me figure it out? It’s number five. I think this shows what I’m really frustrated about, which is that the manual doesn’t have an answer key. I keep getting stuck on a sentence, getting frustrated and putting the book down. I feel like I’m not making any progress. I believe the sentence is "If it snows, Miss Jones will cancel the meeting." My book is the 1960 edition on page 22. Do either of the editions you have include a key for the exercises? It is very frustrating trying to do these exercises and not being able to check my work or know if I have it correct. It is undermining my ability to learn. Yes, I'm in the UK. I'm going to get one of the books that you mentioned as I really need an answer key. Thanks for the help! You're welcome! Since the lessons in the UK and US manuals are for the most part correlated, and since the practice material is different between the books, you can still use the UK manual for additional practice while having the US functional method manual as your main text. If you're on Facebook, you can also check out the group there if you have any quick questions! "eft snos mes Jones l cansel th meting"
"eft snos mes Jones will cancel the meeting"
Now we can work backwards. Jones is a surname so "mes" must be Miss? "eft snos Miss Jones will cancel the meeting"
"eft" could be "He for it" – doesn't make sense. "Ifed" – nope, not a word. "He fored" – not sensible. "If it" – makes sense. Now we should have enough to work out snos is snows, but says it was a word you still couldn't work out. Its either a phrase or it isn't. From the rest of the sentence it would not make sense to be a phrase. Either the word is written out in full or the end is chopped off. 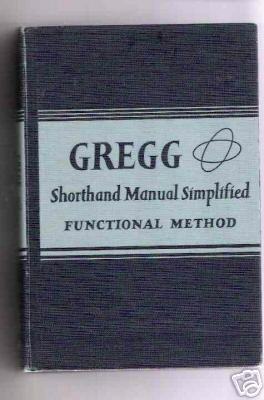 This is Gregg Simplified, so this is unlikely. You do need to look at the context. For example, if it is the beginning of a letter and you have: "thufule dt/d 16 Ju" then it probably is something like "Thank you for your letter dated 16 July". I guess different people learn in different ways. I personally find Niten Ichi's method confusing. 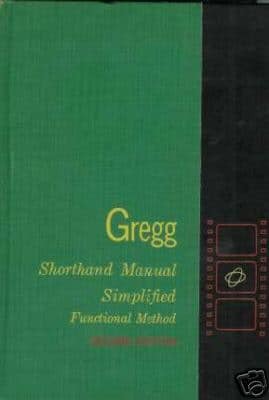 I can read the Gregg fine, because I learned the writing and spelling systems and the short forms thoroughly. But when I see the thing transcribed leter-for-letter into the Roman alphabet, I can't read it; I have to re-transcribe it in my head back into Gregg to understand it. I'm like you and it's one of the reasons I haven't learned any alphabetic shorthand systems — they look awkward to me. I rather sound the Gregg outline than write it, but to each his own.